When Pope Francis disembarks from his plane the minute it lands in the United States this September, he will step onto the soil of that part of the Americas that he has never had the occasion to walk on, the America of the northern hemisphere. It will be a newsworthy event when he does; he will meet and greet a good cross-section of American society, including American governmental officials, particularly the president of the United States. Pope Francis and President Barack Obama have met before, in the Vatican, so they are acquainted with one another. So in this respect, this meeting between the two men will not be new, though it may become news, for it will be their first meeting here, on the shores of the Potomac. It will be safe to say that this encounter will a very cordial meeting, as the previous meetings and visits between recent popes and presidents have been. But it hasn’t always been that way, for relations between the Roman Catholic Church and the United States of America have historically been fraught with tensions, not to mention misunderstandings—on both sides. Given the nature of both institutions, the secular democracy that is the United States and the Catholicism that is represented by the Vatican City State (and the person of the pope), such disagreements (while lamentable) have been unavoidable—as history has recorded. 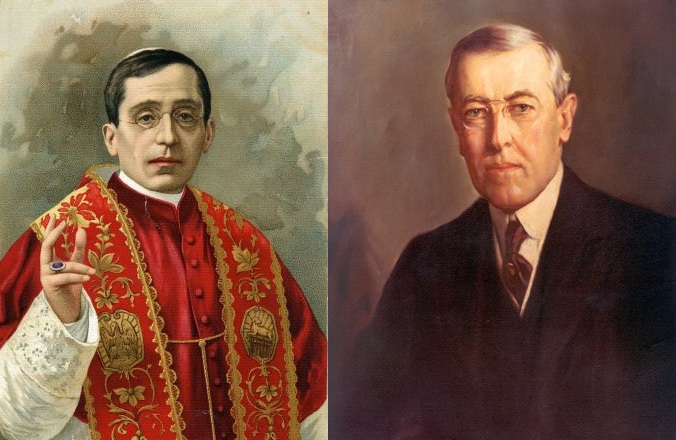 No two men could have been more different: Pope Benedict XV and President Woodrow Wilson. One was a pope and successor of St. Peter, the other, a political science professor turned politician president. Both were high-minded men who were statesmen in a world rent by war, disease and famine. Both saw the need for peace; but their approaches toward that goal were as different as their personalities: the pastoral pope sought to alleviate the suffering and hunger that resulted from the war while the wartime president sought to create a new world order on his terms, as he saw it. In those war years, various peace proposals were floated around, only to be shot down like the soldiers in the trenches. Pope Benedict was tireless in his efforts to prevent the war and then in his efforts to terminate it and afterwards, with his efforts to ensure a just peace. It consumed every minute of his pontificate from the moment he was elected to succeed the saintly Pius X on September 3, 1914. As for President Wilson, it was inconceivable that a man whose only political experience was as governor of the state of New Jersey and a tenure as a university president—of Princeton, to be exact—found himself a president during wartime; he morphed from being a political science professor tuned politician to commander-in-chief of the United States armed forces during the “Great War.” Like Pope Benedict, he, too, was not considered the physically robust type. Nevertheless, he went on to have a career in academia and politics. When war broke out during his presidency, he went from husbanding progressive legislation through the Congress to reviewing wartime tactics and goals and ultimately trying to fathom how a postwar world would look like. When war came, in 1914, both men were early on in their respective capacities as pope and president. Benedict was in office about a month after the conflict erupted. His predecessor, Pius X, died shortly after it commenced that August. He died, it was said, from a “broken heart,” because he could not prevent what was about to happen. It was Pius, when asked to bless soldiers of the Italian army, who said: “I bless peace, not war!” It fell to Benedict to find a way through what would become a disastrous four-year war. It was the war that brought out the idealistic side of the political science professor-president. He dreamed of a peaceful new world and he believed with everything that was in him that he was the divinely inspired instrument to bring about that peaceful world. Thus, both pope and president came up with their respective plans for peace. Pope Benedict’s plan for peace covered ten areas; the main theme of which was the resumption of peaceable relations between nations and the healing of a war-torn world through the assistance of those afflicted by homelessness, hunger and disease. All his pleas for peace were rebuffed; yet he kept trying. President Wilson, however, had other ideas. The American president—it was said—was jealous that the Roman pope had come out first with a prospective peace plan; Wilson felt that he could do better, hence his “Fourteen Points.” As the wags remarked at the time, Wilson had to come up four points better than the pope. By 1919, the four-year war had ended with the Allies victorious and they the ones to determine the fate of the postwar world. It was time to put forward the ideas for that world. By then, President Wilson decided to see Europe for himself and Italy was one of the stops on his itinerary before the peace conference in Paris. No sitting president had ever left the continental United States for such an extended period (six months) as Wilson did in his European sojourn; his doing so was history making in and of itself. On this tour, he would be greeted with great crowds and wild cries of “Vive le President Wilson!” and bask in the adulation. But leaving the country would not be as history-making as what he was also about to do: meet with a reigning pope. On his way to the Vatican, Wilson was thronged by crowds of cheering Italians (as he would be by all people throughout his European tour) and looked forward to addressing them after his audience with the pope. However, that did not happen to the president’s great disappointment—the anti-clerical Italian government of the day wanted to “punish” the American president for meeting with the pope, so they dispersed the crowds so that Wilson subsequently emerged to disquieting silence. When he was escorted into the papal apartments, President Wilson encountered the diminutive figure dressed in white, with the white skullcap atop a head of jet-black hair and a face and body that could only be charitably described as “plain.” (His facial features and physical appearance even led Benedict to refer to himself as being an “ugly gargoyle upon the buildings of Rome.”) Plain though he may have been, Benedict was animated with holiness and kindness and greeted the president accordingly: he took him by the hand and led him into the study for their conference. But it was what happened before that tested the civility of the moment. Pope Benedict had presented President Wilson with gift, a mosaic of the first pope, St. Peter. An interpreter had to be present, since the pope spoke French for this occasion and the president, being an American, only spoke English. After that was done, it was time for the presidential party to be introduced to the pontiff. The president presented his personal physician, Admiral Grayson, to the pope, saying that this “is the man who keeps me well.” In reply, Benedict said: “Apparently, he has done a splendid job.” And turning to Grayson, the pope said: “And you have performed a great service to humanity.” Then the time came for the customary papal blessing—and this was when a minor contretemps occurred. Either he misunderstood, or he was acting as the prickly Presbyterian that he was, but President Wilson wanted clarification. He was reassured by Benedict that the papal blessing was for everyone; he did not discriminate in invoking God’s blessing upon people. Nevertheless, President Wilson turned around (and according to whatever account survived) and basically barked out: “Are there any Catholics here?” (Another account has him saying: “Very well, how many are Catholics?”) While the Catholics in the group knelt, the Presbyterian president bowed his head. It can only be surmised what Wilson’s devoted personal secretary and aide, the Irish-American, Joseph Tumulty, must have felt about that; it did not help Woodrow Wilson’s historical reputation, especially among Irish Catholics. (Wilson was of Scotch-Irish stock; his grandfather, Joseph Wilson, came from northern Ireland's County Tyrone; it was felt, particularly among the Irish, that Wilson had an antipathy toward Ireland and that his basically Scottish heritage colored his view of Catholicism—especially of the Irish kind.) Yet this was the man who had the reputation of being a lover of humanity, but he loathed people as individuals. This was a man who brought his nation into war believing that the right of nations—big and small—to exist was a sacrosanct principle, except when it came to a small country like Ireland. And this was a man who believed in human rights, yet denied them to people of color in his own country (and a people, it must be said, who—like the Irish—fought for those very same principles, but were denied them). And this was the man who would determine along with other men, the world to come. The meeting between pope and president ended. President Wilson went on to Paris and the peace conference, which resulted in the Treaty of Versailles and all that came after it. Pope Benedict would continue his efforts for peace (among nations and within his own church) until he himself would succumb to pneumonia in January 1922 at the age of 67. Pope Benedict XV was honored at the time for his peacemaking efforts; but as time when on, he would largely become forgotten and overshadowed by more outgoing subsequent popes. (Interest would in him would revive briefly when Pope John Paul II's successor, Joseph Cardinal Ratzinger, would choose the name of Benedict for himself. But at the time, the name selection was seen more as an attempt to move away from the Johns and the Pauls of recent papacies than just a recognition of the wartime pope.) As for President Wilson, he would eventually be broken—politically as well as physically—by the strains of peace and he would die two years later, in 1924, also at the age of 67, with his dreams of a League of Nations in tatters until two subsequent Democratic successors would revive it as the United Nations (FDR) and bring it to fruition (Harry S. Truman, upon FDR's death in 1945). Thus, the story of the meeting between Pope Benedict XV and President Woodrow Wilson, reigning pope and sitting president. There would not be another such meeting between two principals for another 40 years until President Dwight D. Eisenhower had the opportunity to meet—and share a few laughs with—"Good Pope John," Angelo Giuseppe Roncalli, Pope John XXIII, in 1959. This will be the first in a series of vignettes on the popes and the presidents. These stories are presented to offer some historical background for those interested in American and Catholic history, ahead of the first visit of Pope Francis to the United States. In an otherwise even-handed account of an extraordinary meeting, the writer lapses into a one sided denigration of Woodrow Wilson. It's suggested that he's the "prickly Presbyterian" who had it in for Ireland, exhibiting a kind of pettiness and anti-Catholicism that contrasts with his image as a humanitarian peacemaker. It is caricature without proof. By comparison, Benedict is the picture of piety, kindness and consistency. Wilson certainly did perpetuate race bias and no doubt harbored ill-will toward some nations and leaders, but by the same measure Benedict sat atop a global institution that bore its own biases and arbitrary judgments. I have no doubt that the description of Benedict's pious character and efforts on behalf of peace is all true, but by not ending some of Catholicism's egregious teachings and policies (see the Syllabus of Errors for starters) was he not at least as guilty of hypocrisy?